Linguistic Note: See Nin in the glossary. The rest of Her name, -Kharsag, stands in some relationship to Im-khar-sag, Storm-Mountain, the staged tower or sacred edifice at Nippur. See also Har linguistic notes, qv Kilili-Mushritu. Description: Great Goddess, Mother of the earth; Creatress of humanity; Creative principal of fertility and fecundity; Creatress of the Divinities of healing; Matron of birth and rebirth; She Who advises on matters of marriage protocol; Giver of curses. Perhaps, under some other name She was the "great primordial principle of fertility and fecundity" first worshipped by the Sumerians which was quickly dispersed into a crowd of divinities. To Whom Sacred: snake; dog; [fox]; headress of leaves with rays on each side; the number 8 (plants She created from Enki's seed). Perhaps variant: Nin-Kharak, Lady-of-the-Mountain, below. Title of Nin-Lil, Lady-of-Power, Who is linked with Zarpanit, Silver-Shining. Also called Nin-Makh, Great-Lady, who is linked with Aruru. Mother of: Nin-Mu, Nin-Makh, below. Mother of: Nin-Sar, see below. Mother of: Nin-Sig, see below. Title assumed by Nin-Sikilla, linked with Dam-Kina, when about to give birth. Mother of: Nin-Ti, linked under Dam-kina. Also called: Nin-Tu, linked with Dam-Kina, possibly a variant of Ninti. Source: ANEv1/28; EB/v3/683b; LWM/59; BGH/219. Male Associates: rand-Daughter and Daughter of Enki, who was also Her lover. Mother of Uttu, by Her grand-father/father Enki. One might suppose Her name to be a variant of Nin-Durra, above, if it wasn't that Nin-Hurra, and Nin-Durra have different Mothers. Daughter of Nin-Kharsag, Lady-of-the-Mountain, above. Mother of Uttu, but see above under Nin-Durra's cross-references. A title of Gula, Who is linked with Gula-Bau, Great-Physician. Her name was adopted as a title of Ishtar, Light-Giving. Perhaps a variant of Nin-Kharsag. Male Associate: father and lover, Enki. 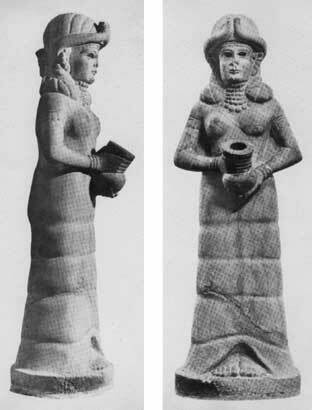 Mother of Nin-Durra, above, by Enki. Daughter of Nin-Kharsag, Lady-of-the-Mountain, (above), by Enki. Also called Nin-Sar, ----, below. Source: Monaghan BGH 221; LWM/61. Perhaps Nin-Sig, (below), is a variant transcription. Perhaps a transcription variant of Nin-Sar, above. worked on: December, May 1995; August 1991; August 1990.